University of Wisconsin-Madison postdoctoral researcher Jesus Ballesteros holds a small horseshoe crab. 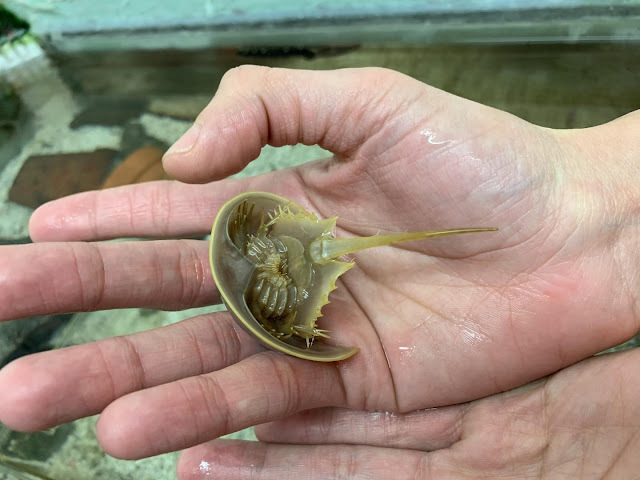 "By showing that horseshoe crabs are part of the arachnid radiation, instead of a lineage closely related to but independent of arachnids, all previous hypotheses on the evolution of arachnids need to be revised," says Ballesteros, a postdoctoral researcher in Sharma's lab. "It's a major shift in our understanding of arthropod evolution." Horseshoe crabs have been challenging to classify within the arthropods because analysis of the animals' genome has repeatedly shown them to be related to arachnids like spiders, scorpions, mites, ticks and lesser-known creatures such as vinegaroons. Yet, "scientists assumed it was an error, that there was a problem with the data," says Ballesteros. Even then, genetic comparisons become tricky when looking at the histories of genes that can either unite or separate species. Some genetic changes can be misleading, suggesting relationships where none exist or dismissing connections that do. This is owed to phenomena such as incomplete lineage sorting or lateral gene transfer, by which assortments of genes aren't cleanly made across the evolution of species. He says his approach serves as a cautionary tale to other evolutionary biologists who may be inclined to cherry-pick the data that seem most reliable, or to toss out data that don't seem to fit. Researchers could, for example, "force" their data to place horseshoe crabs among crustaceans, says Sharma, but it wouldn't be accurate. The research team tried this and found hundreds of genes supporting incorrect trees. It's possible the common ancestor of arachnids evolved in water and only groups like spiders and scorpions made it to land. Or, a common ancestor may have evolved on land and then horseshoe crabs recolonized the sea. For Ballesteros, who is now studying the evolution of blindness in spiders living deep within caves in Israel, his motivations get to the heart of human nature itself. "I get to look with childish curiosity and ask: 'How did all this diversity come to be?'" he says. "It's incredible what exists, and I never thought I would have the privilege to be able to do this."